Safe Jurisdiction: Relief Canyon is located in Nevada, USA, one of the world’s best mining jurisdictions. Americas Silver has mining and processing permits in place to start operations at the Relief Canyon mine. In exchange for US$25 million, Sandstorm will receive 32,022 ounces of gold over 5.5 years followed by 4.0% of the gold and silver production from the Relief Canyon Mine. Sandstorm will also have a 1.4% – 2.8% net smelter returns royalty on the area surrounding the Relief Canyon Mine, plus a four kilometre area of interest (the “NSR Royalty”). 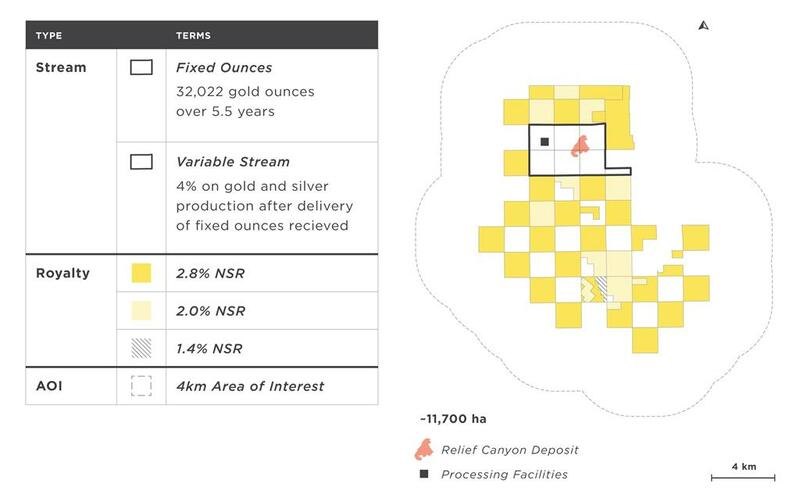 Beginning 60 months after the commencement of the Delivery Period, Sandstorm will receive 4.0% of the gold and silver produced at the Relief Canyon Mine for the life of the mine (the “4.0% Stream”) and will pay Americas Silver 30% -65% of the spot price of gold and silver for each ounce of gold and silver delivered (the “Ongoing Payment”). The Ongoing Payment percentage varies by concession and is calculated based on the pre-existing royalty burden. The US$10 million convertible debenture bears an interest rate of 6% per annum and has a term of four years (the “Debenture”). Sandstorm has the right to convert principal and interest owing under the Debenture into common shares of Americas Silver, at any time prior to the maturity date, at a conversion price US$2.14 per Americas Silver share. Pursuant to National Instrument 62-103 – The Early Warning System and Related Take Over Bid and Insider Reporting Issues, Sandstorm is announcing the acquisition of an aggregate of 3,553,500 common shares (the “Entrée Acquired Shares”) of Entrée Resources Ltd. (“Entrée”), representing approximately 2% of the outstanding common shares of Entrée (the “Entrée Shares”). approved the technical information in this press release. This press release contains “forward-looking statements”, within the meaning of the U.S. Securities Act of 1933, the U.S. Securities Exchange Act of 1934, the Private Securities Litigation Reform Act of 1995 and applicable Canadian securities legislation, concerning the business, operations and financial performance and condition of Sandstorm. Forward-looking statements include, but are not limited to, the future price of gold, the estimation of mineral reserves and resources, realization of mineral reserve estimates, and the timing and amount of estimated future production. Forward-looking statements can generally be identified by the use of forward-looking terminology such as “may”, “will”, “expect”, “intend”, “estimate”, “anticipate”, “believe”, “continue”, “plans”, or similar terminology.